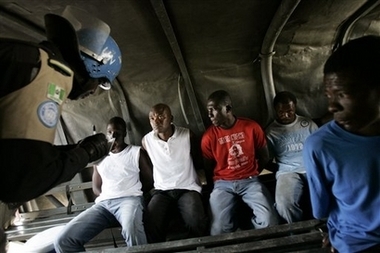 PORT-AU-PRINCE, Haiti, Feb. 28, 2007 - U.N. peacekeepers and Haitian police seized the last remaining gang stronghold in Haiti's largest slum on Wednesday, the latest in a series of military crackdowns aimed at stabilizing the impoverished and divided Caribbean nation. No shots were fired as scores of U.N. troops entered the seaside slum of Cite Soleil in armored vehicles and on foot, giving the international force sole authority over the lawless area for the first time, according to one U.N. official. The soldiers took over the gritty Bois Neuf quarter, a base for armed gangs blamed for a wave of kidnappings and killings. Seven suspected gang members were arrested in the raid but their leader, known as Beloney, managed to escape. It was the last gang stronghold in Cite Soleil not occupied by the 9,000-strong U.N. force, known by its French acronym, MINUSTAH. Peacekeepers seized two other gang strongholds during raids earlier this month. "In terms of territory, 100 percent of Cite Soleil is now controlled ... by MINUSTAH with the support of the Haitian government," Brazilian military commander Col. Magno Barroso told The Associated Press. But U.N. spokeswoman Sophie Boutaud de la Combe gave a more conservative assessment, saying only that peacekeepers "had established a presence everywhere that gangs had controlled," but do not have full control over the entire slum. Wednesday's raid coincided with the third anniversary of the uprising that toppled former president Jean-Bertrand Aristide, Haiti's first democratically elected leader. Aristide went into exile in South Africa. At the United Nations in New York, U.N. deputy special representative Joel Bortroue said the Haitian government desperately needs the support of the international community if the fledgeling democracy is to stay afloat. He said that countries such as Haiti, which are coming out of long periods of conflict, have a strong tendency to relapse unless there is "strong and coherent support from the international community." Bortroue said funds must be "injected" into impoverished areas in the form of food distribution and school funding, as well as labor intensive projects such as rebuilding schools and cleaning canals that could spur economic development. 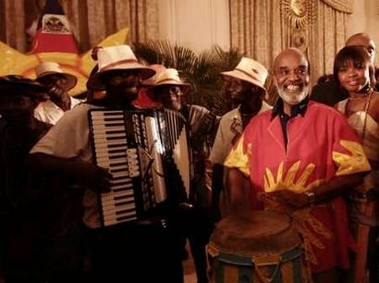 Nothing at all to do for dirt-poor Haiti, increasingly violent Haiti, extreme violence-issued President Preval now "carnival king, lead musician"
UNITED NATIONS, Feb. 15, 2007 (AP) -- The Security Council voted unanimously Thursday to extend the U.N. peacekeeping mission in Haiti for eight months following an agreement between the United States and China on the length of the new mandate. In a report in December, former U.N. Secretary-General Kofi Annan recommended that the 8,800-strong mission be extended for one year when its mandate expired February 15, a view backed by the Friends of Haiti, whose members include the United States, Canada, Brazil, France and Britain. But China, which has no diplomatic relations with Haiti, pushed for a six-month mandate. Diplomats in Haiti have said China wanted the shorter mandate because of Haiti's support for Taiwan's bid to join the United Nations. 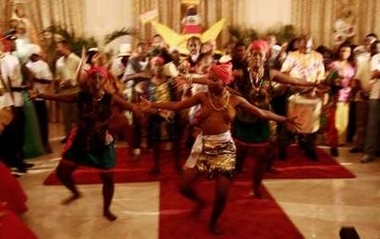 Haiti is one of a handful of countries that has diplomatic ties with Taiwan. China and Taiwan split amid civil war in 1949, but Beijing still claims sovereignty over the island. During negotiations, diplomats said China proposed an eight-month extension for the force, but the U.S. wanted a nine-month extension. "We have agreed to eight months in the interests of continuing the presence on the ground, but we did support the Friends of Haiti position of 12 months," said U.S. deputy spokesman Ben Chang. Acting U.S. ambassador Alejandro Wolff called the vote " an important signal of the determination of the international community" to support the U.N. mission. "This is good news," he said, noting that all previous extensions had been for six months and this was the lengthiest extension for the mission. China's U.N. Ambassador Wang Guangya said Beijing hopes that during the next eight months, Haiti can move from a peacekeeping operation to a peacebuilding mission. He complained that the resolution was "not as balanced and comprehensive as expected" because it "overemphasizes military means but fails to pay adequate attention to political reconciliation and economic recovery." Nonetheless, Wang said, "China agreed to put aside some pending issues to facilitate consensus." He expressed hope that these issues will be addressed when the council considers renewing the mandate in October. 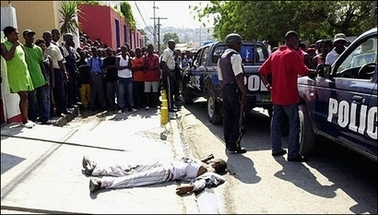 Peacekeepers arrived in Haiti in July 2004 to quell unrest sparked by an uprising that led to the ouster of former president Jean-Bertrand Aristide. The U.N. peacekeeping force -- which includes about 125 Chinese police officers -- has recently stepped up offensives to root out armed gangs that hold sway in slums in Haiti's capital, Port-au-Prince. The gangs are blamed for a wave of kidnappings and other violence. The resolution calls on the U.N. force to "continue the increased tempo of operations" against the armed gangs to support the Haitian police "to restore security, notably in Port-au-Prince." It encourages the government and the U.N. force "to undertake coordinated deterrent actions to decrease the level of violence." It asks the U.N. force "to accelerate efforts to reorient its disarmament, demobilization and reintegration resources towards a comprehensive violence reduction program" in coordination with the government. The resolution recognizes the government of Haiti's "ownership and primary responsibility ... over all aspects of the country's stabilization and good governance" and the U.N. role in supporting the government's efforts.